Questioning love. Love of someone or something, what is it that makes good people get treated badly? Why do we “stick” with someone or something that isn’t good for us? Is it based on past experiences? The fact that at some point, we all go through a bad time, a trauma or dramatic event in our lives and that defines what we think we deserve. Is it the perception of our own definition that can limit possibility? It made me question my perception of myself, and my life. The line/advice speaks to being in control of you, your future. Loving yourself. Using the mind to accomplish what is needed in life. Not having fear, a loss of confidence in oneself, “it” controlling your future. Going after what you want with sheer confidence, complete and utter love for yourself—trust in yourself. It’s good when something stops you and urges you to think, listen, and grow. P.S. 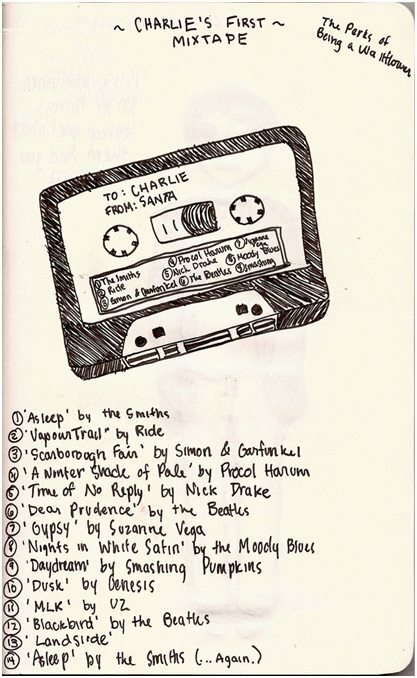 the film includes a fave past-time of mine—prevailing your love for someone via the ultimate flirtation device, the mixtape! Posted on February 18, 2013 October 31, 2017 by Table Without BordersPosted in TechTagged michelle swift, The Perks of Being a Wallflower.